Weekend backpacking trips are one of the greatest gifts of the summer. You can get so much in just two to three days: a breathtaking vista, a serene mountain lake, a secluded old-growth forest. The only problem is that all too soon you’re back at the trailhead, preparing for the long drive home and wondering how you’ll get through five more days before your next big adventure. Usually, this is when hikers start to google “Appalachian Trail Town Guide” or “PCT Gear Checklist,” but if you aren’t quite ready to quit your job and sell your house, there are other long trail options, ones that can be squeezed in alongside life’s many other responsibilities. And since these trails don’t get the same press as the jewels of the triple crown, the odds of getting a week of breathtaking vistas all to yourself are even better. 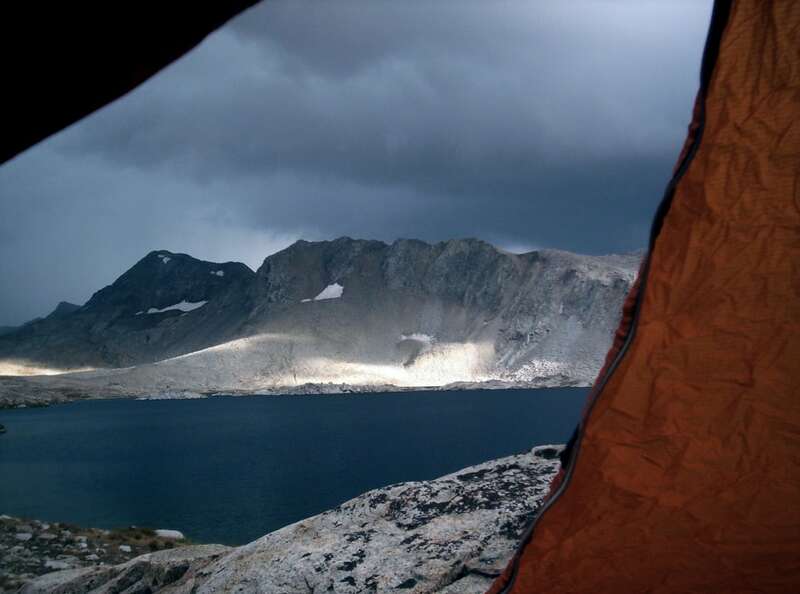 The granddaddy of them all, the John Muir Trail offers a wholly unique adventure for intrepid backpackers: 211 miles of trail without a single road crossing. Starting at a mere 4,000 feet in Yosemite Valley, you’ll soon leave behind the crowds as you climb up above the treeline and into the high country where no fewer than eight mountain passes await you. Make no mistake about it, the remoteness (not to mention the difficulty) of this trail requires serious training and planning, so be prepared to cross snowfields, wade through swollen rivers, and safeguard your food from the area’s notorious bears. The majority of JMT hikers are headed southbound, but you’ll still see plenty of northbound hikers along the way, as the PCT shares 170 miles of trail through the High Sierras. The only real downside to this trail is its popularity as most reservations are snapped up months in advance of hiking season. Leave behind the noise and crowds of Houston and travel an hour north to find the solitude and quiet you’ve been craving on the Lone Star Hiking Trail. 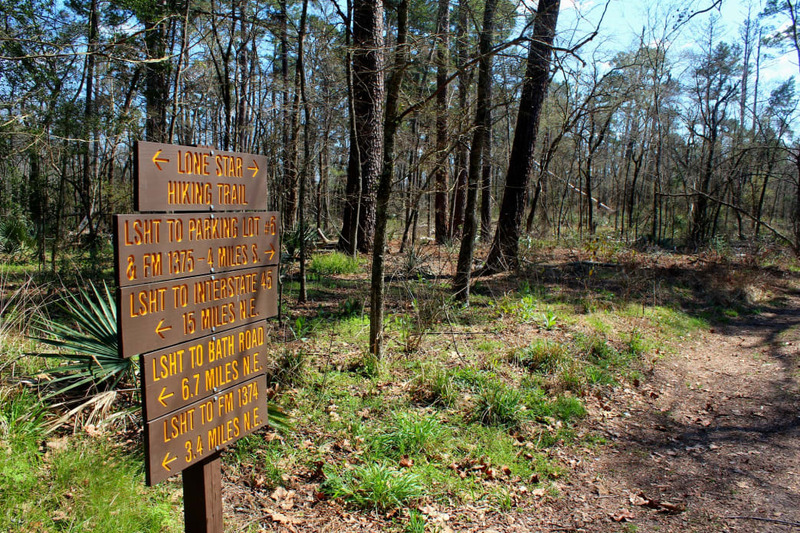 Tucked away in the Sam Houston National Forest, this 128-mile pine needle-cushioned footpath takes you deep into the backcountry along serene, bubbling creeks and over gentle slopes. As you hike, you’ll wind your way through dense stands of magnolia trees and miles and miles of hardwoods, home to woodpeckers and bald eagles alike. This is one of the few long distance trails that can be hiked year-round, and might even be best in winter, when the scorching temperatures of Texas are moderated. Another bonus: no permit is required to get started, and maps can be downloaded for free at the volunteer-maintained website. America’s obsession with thru-hiking may well have started with the Long Trail, the country’s oldest long-distance route, and the inspiration for the Appalachian Trail. Traveling the length of Vermont, the bulk of its 272 miles trace the ridges of the Green Mountains, traveling along remote streams and through alpine sedge, and climbing the state’s highest peaks: Camel’s Hump, Killington Peak, Mount Mansfield, and more. But this trail is known less for the views than as a rugged journey through a thick forest of hemlocks, eastern white pines, sugar maples, and balsam fir. 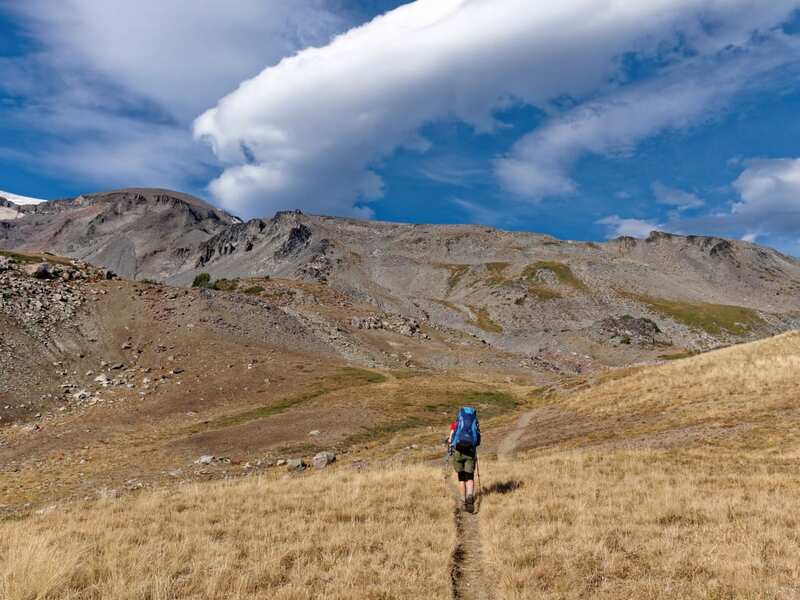 Be aware that while this trail doesn’t reach the same elevations as its Western cousins, it offers significant terrain challenges for the novice and advanced hiker alike. Expect scrambling, slippery log crossings, and rough trails. Today, the LT shares 100 miles of trail with the AT, but while the latter stops midway through Maine, the LT takes you all the way to the Canadian border. 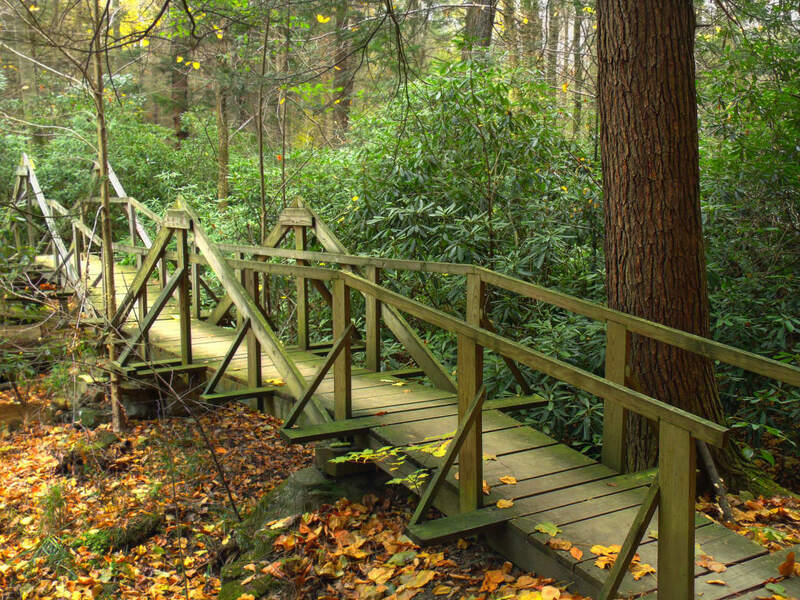 If you’re looking for something a little longer, and little wilder, check out the 522-mile Mid State Trail running straight down the middle of Pennsylvania. 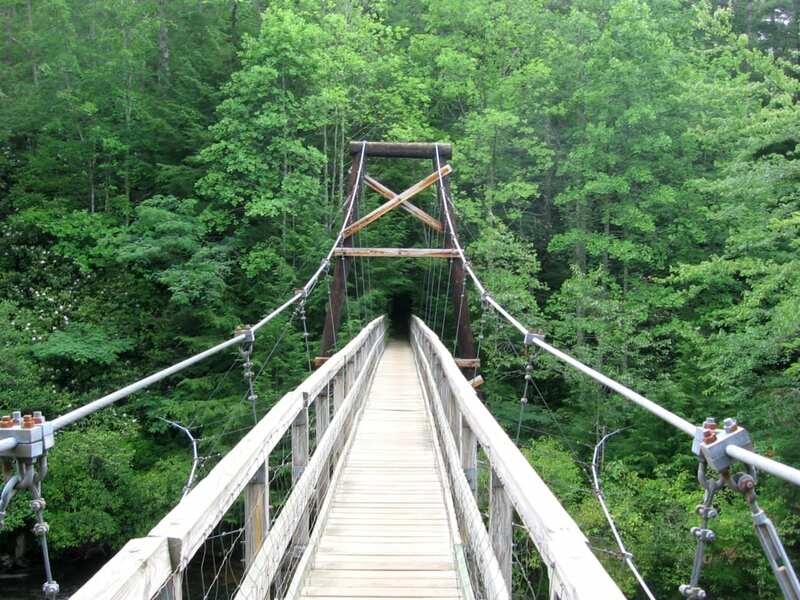 Straddling the Appalachians and the Allegheny plateau, this path is unusually solitary and remote, even as it brings you within spitting distance of established communities (and one or two ghost towns). It accomplishes this by keeping hikers above the fray, traveling from the highest knob and steepest ridgelines, across densely forested highlands, and up and around rolling hills. Like many of the trails in this region, the route is scattered with boulders of varying shapes and sizes, making it difficult to cover ground quickly. But, unlike those other trails, the secret’s not out on this one yet, and it’s a toss-up which you’ll see more of as you hike: bears or backpackers. 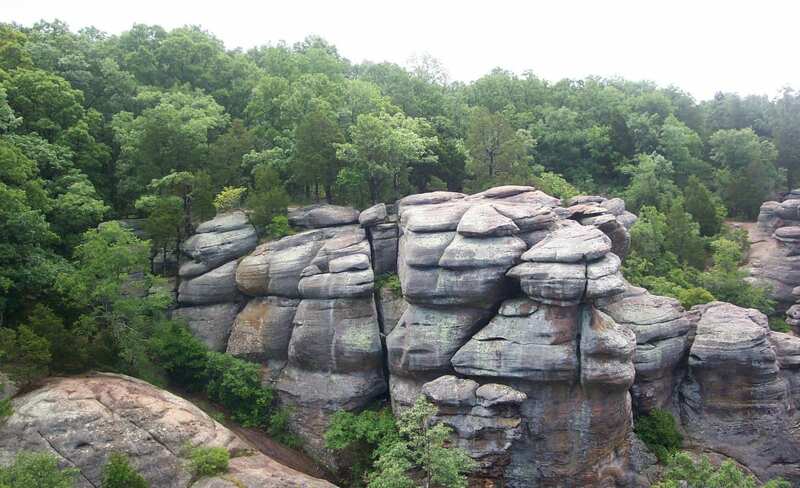 If your ideal wilderness trek is one where you won’t encounter another hiker for days on end, the Ozark Highlands Trail should be near the top of your list. But even if you start out in search of the trail’s peaceful valleys and lonely vistas you’ll stay for its smaller wonders: delicate waterfalls, remnants of bygone pioneers, and impressive rock formations, like the Narrs: a narrow catwalk of stone snaking along the Buffalo River. While reasonably well-marked, this trail is more rustic than most, so be prepared for your feet to get wet (and stay wet) during its many stream crossings. Fortunately, there are a number of ancient structures scattered along the way where you can air out and dry off. 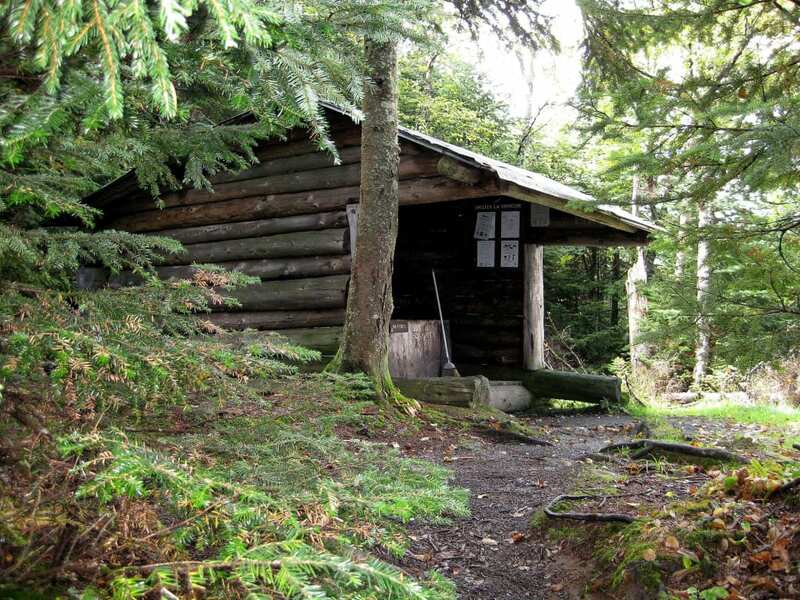 Procrastinating thru-hikers may rejoice that this one doesn’t require a special permit to get started, but know that the remoteness of the terrain and the difficulty of resupply (there are only two POs and no grocery stores along the way) mean it requires just as much, if not more, planning. Even if you don’t have the time to hike the entire 6,800-mile American Discovery Trail, you can still tackle an important leg of it: the 160-mile River to River Trail travels across southern Illinois, from the Ohio River to the Mississippi. If you’ve never been to this part of the country, you’re in for a real treat. Towering slot canyons, sandstone sculpted bluffs, dense deciduous forests (hike this one in fall if you can), and, of course, sweeping views of two of the most iconic rivers of the Midwest are but a few of the treasures to be found along the way. While the forests surrounding this trail look untouched today, don’t be fooled, as you may be following an ancient wagon trail, long overgrown. 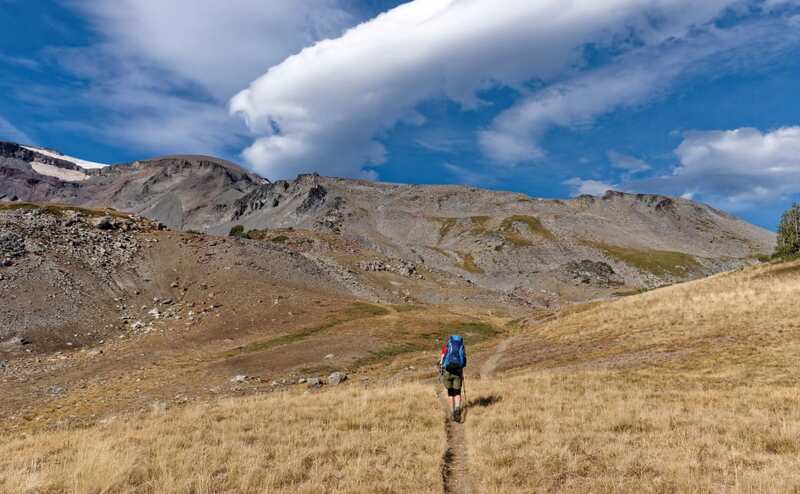 A word of caution: since this trail is not maintained to the same standards that you’ll find in established wilderness areas, aspiring thru-hikers should come prepared with serious navigational skills. Begin your adventure by dipping a toe into Lake Huron at one of two starting points on the eastern half of the 220-mile Shore-to-Shore Trail. 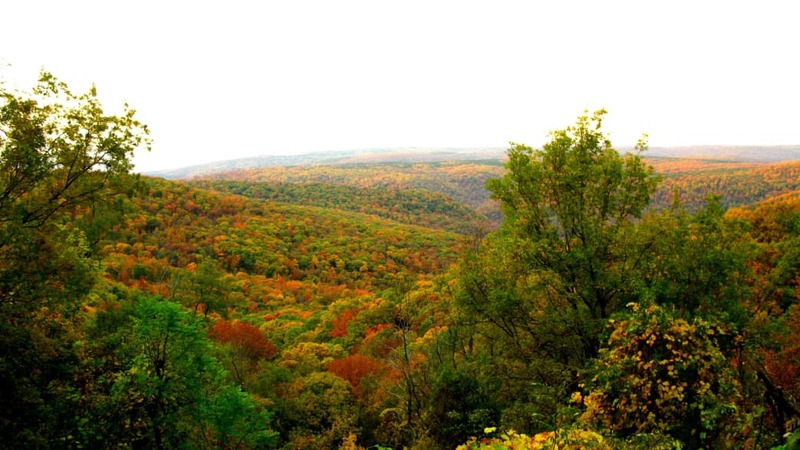 As you travel west, wander through warbler territory, join up for a section of the 4,600-mile North Country Trail, and then skirt the more popular tourist destinations as the trail winds across the rolling hills that characterize the middle of the state. 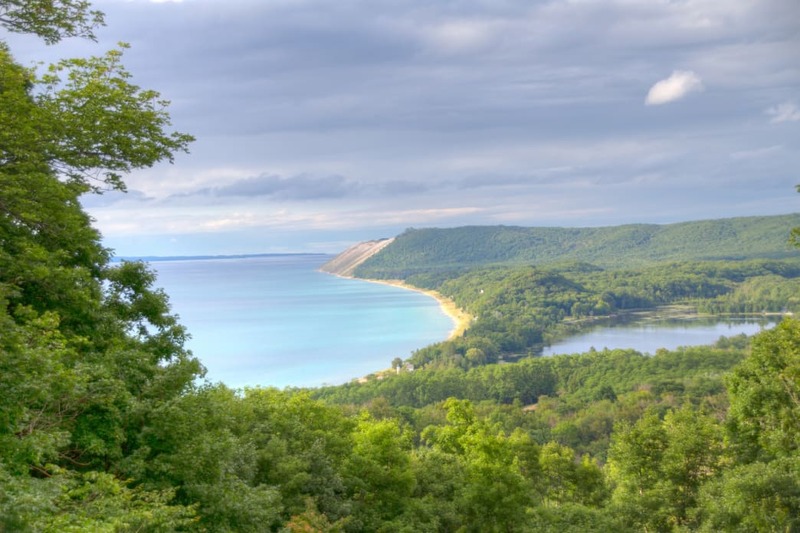 End your trip with a plunge into Lake Michigan via the steep bluffs of Sleeping Bear Dunes National Lakeshore. While there are many upsides to choosing this thru-hike, one downside is that heavy equestrian use can make this trail more challenging for those traveling by foot. Expect longer distances between established campsites (20-25 miles), deep grooves along the path, and maps that are more focused on the needs of thru-riders than thru-hikers. While Tahoe’s beaches are packed with tourists you’ll be high up on the ridgeline enjoying stunning vistas on this 165-mile loop around the lake’s perimeter. This one is anything but routine, traveling through densely wooded forests, up high mountain passes (there may be snow early in the season), and around the shores of shimmering lakes set against the moonscapes that are specific to this region. 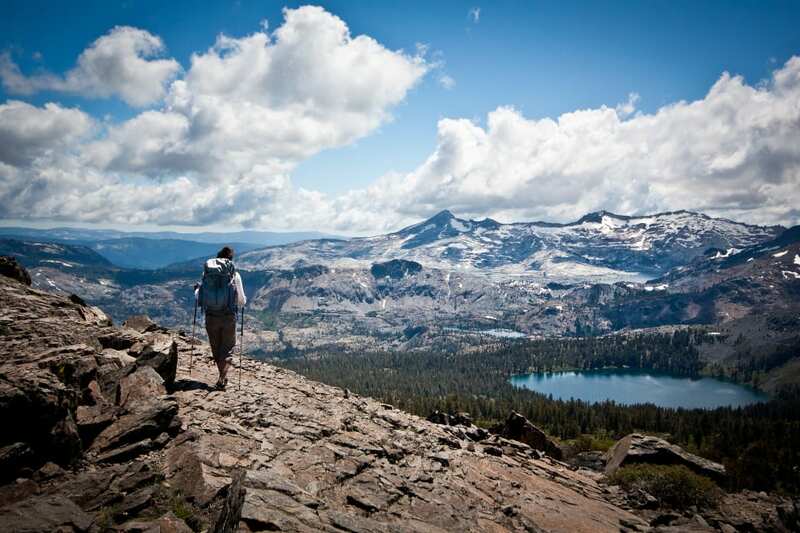 The TRT also shares a footpath with the Pacific Crest Trail for 50 miles through the Desolation Wilderness, offering ample opportunity to get some insider info before you plan next year’s big hike. Give yourself a minimum of a week to complete if you’re doing it all in one shot, or break it out into 14 separate day hikes and earn your Weekend Warrior stripes. Added bonus: since the TRT is a loop rather than an end-to-end thru-hike, transportation planning is a snap. 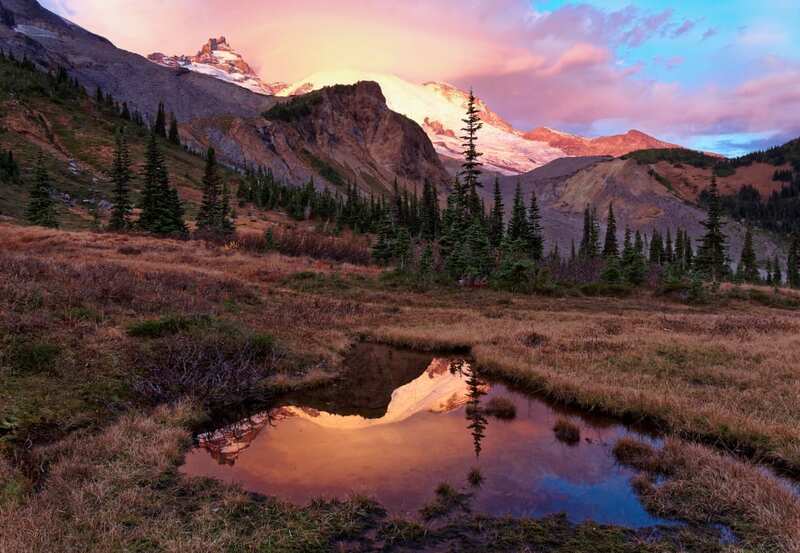 Discover 93 miles of pure heaven circumventing Washington’s most iconic peak. Its jaw-dropping spectacles include fields ablaze with wildflowers of all colors, bridges hundreds of feet over raging rivers and waterfalls, and a new angle from which to see the mountain up close and personal every single day (at least as long as PNW’s infamous weather cooperates). While you’re not climbing Mt. Rainier (14,411 feet), expect significant elevation change (22,000 feet in all) as you climb up and over its many ridges. The Wonderland Trail’s reputation has grown in recent years from a local treasure to a national destination, but if you have a flexible schedule this might just be the perfect year to hike it. A glitch in the reservation system for 2016 means that all reservations are now first come first serve, making it easier than ever to secure a last-minute spot on a once-in-a-lifetime thru-hike.